10.0" x 11.9" stitched on 14 count. 7.8" x 9.3" stitched on 18 count. Up! 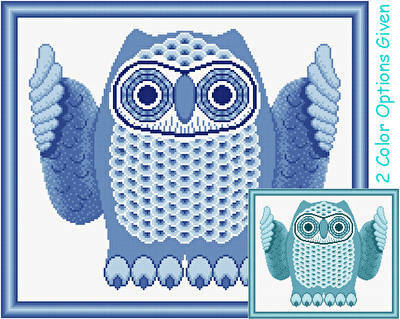 cross stitch pattern... This little owl is reaching up to be picked up and held. The eyes are pleading for attention. Optional DMC turquoise colors are given. Whole stitches.